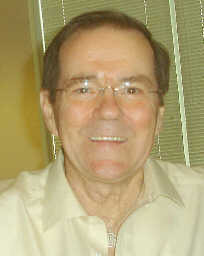 Read Bobby Matherne's Latest Writings: Click Here! By the title I do not mean to say that art consists of destroying things because if that were so, there would be many more artists in the world than there are currently. No, by artists I refer to the same artists as you might think of as true artists — Picasso, Van Gogh, Monet, Matisse — to mention specific examples by which to define what I mean by artist and therefore by the word art. In ballet one might think of Isadora Duncan or Rudolf Nureyev, in music, Mozart, Bach, Beethoven, or Tchaikovsky; in literature, T. S. Eliot or James Joyce. What distinguishes the art of these artists from that of their lesser known or since forgotten contemporaries? That is the question I wish to address — the question whose answer is both the title and the subject of this essay. Process — what do I mean by process? Process is a noun that refers to an activity that is ongoing in the present moment. An example is the strokes my ballpoint pen traces from left to right across this page with an occasional hand lift movement back to the left margin of this quadrille pad. What is your process just now? Are you seated on a subway train reading a folded magazine and looking up every so often for your stop? Are you reading it from the screen of your computer? Are you in an easy chair in front of a crackling fire, setting this essay down every so often to turn over a log to restore the blaze? Whatever you are doing now is what I consider to be process. Process, by my usage, is synonymous with the verb happen — it is what is happening right now that constitutes process. If we are discussing some other time, then process may be what is happening at the other time being discussed, but I prefer to use another word, content, for other time/place discussions. Using process only to refer to present activity maintains the primary distinction I wish to make. By content I mean what we say about what is happening right now (or some other time). These words you are reading are content, your act of reading them is process. Consider the following apothegm, "Every verb has two natures: a process nature and a content nature." One might think of bicycle — the noun form of the word is content (refers to the machine) and the verb form is process (refers to the act of riding the machine). 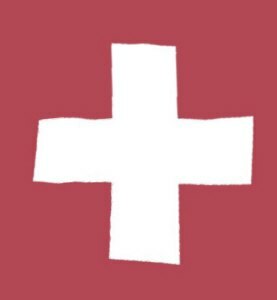 The noun and the verb constitute a basic grammatic distinction, a primary distinction that is built into the typical European-based language. But consider only the verb bicycle — when I say "I am bicycling" or "Watch me bicycle" I am using the process form of bicycle. When I say "We bicycled along the lake" I have switched to the content form of the verb because I am talking about the process bicycle. Thus talking about anything is content, even if the very thing we talk about is a process. The remarkable thing is that this happens to every verb. It even happens to happen, as this very sentence demonstrates. All of the above is necessary that I may point to my meaning of the word process in the titular sentence "Art is the process of destruction." I mean process to be a pointer to the ongoing activity of an artist — that is to say that the very production of an original work of art involves the actor/agent we call artist in the activity we call destruction. "What is being destroyed?" one might ask, especially since I said I was not referring to things being destroyed. Instead I was referring to a characteristic of things, namely the similarity of things, or to use a word I prefer, the sameness of things(1). Art is the ongoing activity of someone who is destroying (or you may prefer removing) sameness. 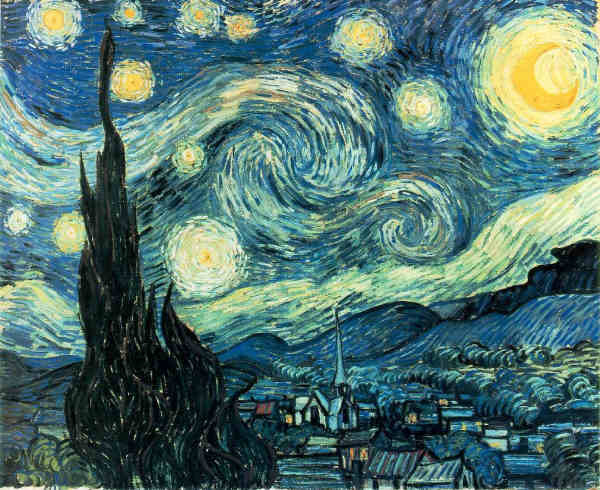 Art is rightly used to refer to Van Gogh's painting Starry, Starry Night. Whichever way that anyone had painted a starlit night before — no one had painted one like Van Gogh. In fact, if that all the paintings of starry nights up until his time were put into one room, they would be more like each other than like Van Gogh's painting. Van Gogh was an artist, and when he painted he destroyed a sameness in the process of painting that had existed since the beginning of painting itself. Art is the process of destruction of sameness. "But wait," you may be thinking, "isn't art supposed to be about creation not destruction?" Yes, it is, at least in the conventional wisdom. Artists are creative, aren't they? How can we reconcile the opposing concepts of creation and destruction as both being the province of the artist? Angels are partisans not of Good, but of divine creation. The Devil, on the other hand, denies all rational meaning to God's world. 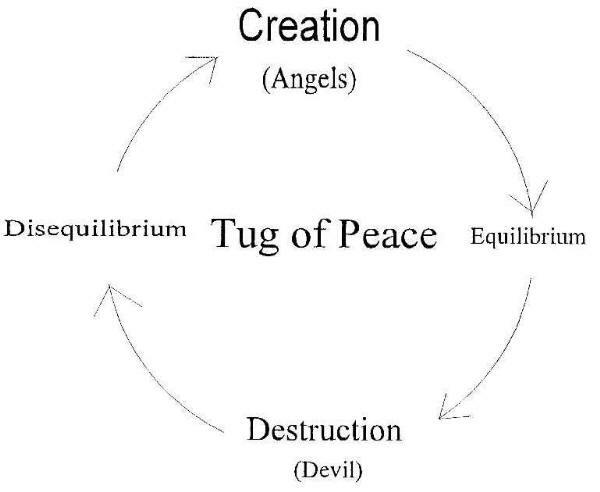 Kundera went on to discuss "a certain equilibrium of power" between Angels and the Devil, and I turned to the rear overleaf and drew the following diagram to help to understand the process of the tug of war, what I would prefer to call the tug of peace between the Angels and the Devil. The thought hit me with shattering force: Art is the process of destruction! But, but, but, but, . . . the word kept repeating itself in my mind as I was forced to re-examine all the conventional wisdom that this brief insight had destroyed(3). The word kitsch came pouring through the floodgates thrown open by this abrupt denial of "all rational meaning to God's world" of art. Kitsch was the focus of Kundera's The Unbearable Lightness of Being — "one of the pillar-words of the novel" in the author's own words (from The Art of the Novel by Kundera). "In Prague, we saw kitsch as art's prime enemy," he said a few sentences later in The Art of the Novel. If kitsch is an enemy of art, then kitsch must be the sameness produced by the process of creation and art must be the exciting possibilities produced by the process of destruction. Therefore: Art is the process of destruction(4) . The process of destroying sameness liberates exciting possibilities that generate the creation of objects that will be similar to one another, no matter how beautiful. Over time the Picasso original migrates into tee-shirt shop kitsch. When Picasso was told by a stranger on a train that his paintings didn't look like real people, he asked the stranger if he was married and did he have a photo of his wife. The stranger took out a photo and said, "That's my wife." Picasso looked at the photo, and, turning it over in his hand, said, "She is very small, black and white, and flat, isn't she?" By recognizing the planar flatness of images and painting them in his cubist paintings Picasso was destroying the representational sameness of contemporary painting and generating exciting possibilities for seeing and art that was to seed a whole new generation of artists. When friends told Picasso that his portrait of Gertrude Stein did not resemble her, he said, "That's okay. It will." When Gertrude first saw it, she said that he had seen all of her, her insides and outsides. Picasso knew it would take time for others to see the insides of her in his painting and that was okay with him. Adelbert Ames was an artist in the scientific field of perception because he systematically destroyed people's unquestioning belief (sameness) in what they saw. He encouraged all who came to witness his perceptual experiments to examine the insides and outsides of the box before and after each experiment — to no avail — once they looked through the peephole, solid objects grew and shrunk before their very eyes as they moved levers. Ames was experienced in the process of destruction as he taught us how our perceptual apparatus really worked. Another artist from the scientific world was Nikola Tesla. He destroyed the sameness of direct current by creating a generator and motor that used current that never stayed the same — it ebbed and flowed constantly in alternating currents — completely changing its direction sixty times a second. Edison commissioned the first electric chair in order to prove how dangerous alternating current was to the public compared to his safe direct current. Edison was concerned with creation (production and replication of ideas) while Tesla was concerned with art — the process of destruction (liberation of exciting possibilities). Kitsch is imitation art: frame gallery art, shopping mall art, crafts fairs, etc. It comprises what most people think of when they think of art, up until now. You won't understand the "limitation" of kitsch until you learn to see the "imitation" that is contained in it. Art is direct Intuition — a gift of the spiritual world, rightly understood. True artists are few and far between, only a handful per decade it seems to me. Most of what is called "art" is imitation of true art and therefore kitsch. Kitsch: you admire an imitation of something and as time goes backwards for you, fewer and fewer examples of what you admire are available and soon you are left with only the original, the real work of art. Art: you admire something beautiful that you've never seen before and soon	that one work of art disappears and with it even the memory of its existence is lost forever. Now let's run the clock forward again and look at a sea of kitsch filling our lives. Out of this sea of kitsch, an island rises up where none existed before with a work of art on it. Does it get admired immediately? No, given the general low level of understanding of art, it is considered ugly because it doesn't look good, you know, like the kitsch out of which it emerged. Soon others are making replicas of the art work, and even the artist has matured in the new form and so is making better examples of the original work for sale. People who formerly disliked it, say, "Oh, look, it's not so bad." "So and so says it's good." and that kind of artsy cocktail party talk. Over time the formerly new and original artwork sinks to the level of kitsch and we await a new artist, with a new intuition from the spiritual world, to break through the sameness of kitsch and raise up a new island, a new artwork for the world. One definition of serious art, offered by Agnes Heller and Ferenc Feher . . . [is] ' a particular activity oriented towards beauty and its objectification.' That positive characterization we shall later be questioning as either false, since in ordinary senses of the word there is a great deal of serious art which is by no means 'beautiful' or, alternatively, as so re-defining beauty that statements relating it to art come out as being tautological. If "art is the process of destruction," then serious art will likely be un-beautiful to contemporary eyes that have been so clouded by cataracts of conventional wisdom as to be blind to nascent Van Goghs or Picassos. 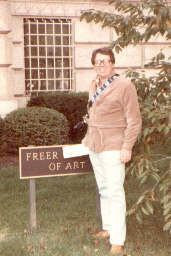 What Heller and Feher were defining was not art but creation as indicated at the top of my Cycle of Creation above. Creation is the process of objectification, and if what it objectifies is also beautiful, conventional wisdom has been to call it art, up until now. 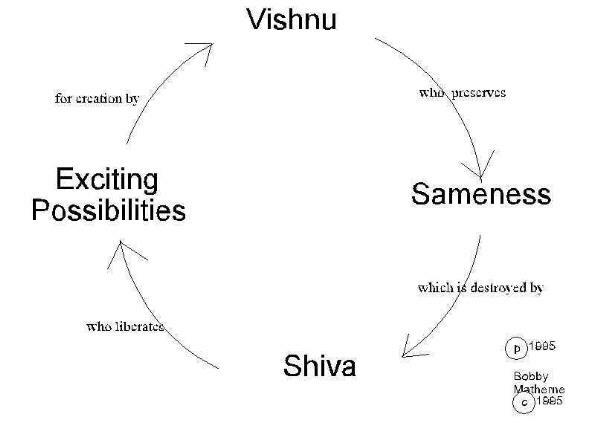 Thus we see that in our Western society the industrialist is the epitome of Vishnu and the artist is the epitome of Shiva. May they both, by learning that art is the process of destruction, come to understand and respect each other's lives and occupations from now on. Listening to Prof. John Sutherland lecturing on Oscar Wilde's contribution to Classical British Literature (A Teaching Co. course), I became aware that Wilde understood the process of art as the destruction of samenes, which is another way of saying that original art comes from what seems to be artifice, but has its origin as a direct input from the spiritual world. The artifice is the result of human conversion of soft-brain insights into hard-brain productions over time. True art appears as a blatant lie, because nothing in the material world resembles it when it first arrives. Oscar Wilde was filled with such inspirations and his work reflected it. No one had ever seen a subject in a painting who grow older while the man it was painted of remained young, as in "The Portrait of Dorian Gray." But his play, The Decay of Lying, lays bare the spiritual roots from which Wilde extirpates the process of lying. Read how Wilde in the voice of the young man, Vivian, rebuts Cyril who immediately thinks of politicians as liars, although few if any of that ilk can be deemed true artists. Politicians in the coercive bureaucracies extant across the world can only further themselves immorally (by supporting coercion) and thus cannot utilize the necessarily moral impulses which flow from the spiritual world. VIVIAN. I assure you that they do not. They never rise beyond the level of misrepresentation, and actually condescend to prove, to discuss, to argue. How different from the temper of the true liar, with his frank, fearless statements, his superb irresponsibility, his healthy, natural disdain of proof of any kind. After all, what is a fine lie? Simply that which is its own evidence. If a man is sufficiently unimaginative to produce evidence in support of a lie, he might just as well speak the truth at once. No, the politicians won't do. I. Art never expresses anything but itself. It has an independent life, just as Thought has, and develops purely on its own lines. It is not necessarily realistic in an age of realism, nor spiritual in an age of faith. So far from being the creation of its time, it is usually in direct opposition to it, and the only history that it preserves for us is the history of its own progress. Thought also arrives from the spiritual world and is converted into words and images in our brain. Like Thought, Art (true art) arrives unbidden and fresh in our brain and nothing like it has ever existed in the materialistic world before, such as Picasso's first cubist painting was unique. II. All bad art comes from returning to Life and Nature, and elevating them into ideals. Life and Nature may sometimes be used as part of Art's rough material, but before they are of any real service to art they must be translated into artistic conventions. The moment Art surrenders its imaginative medium it surrenders everything. As a method Realism is a complete failure, and the two things that every artist should avoid are modernity of form and modernity of subject-matter. What is "bad art" but the replication of true art (e. g. imitations of Picasso's cubist paintings, typical shopping mall artwork, etal ) or the replication of things of the material world (Life and Nature) with photographic or otherwise exact versimilitude. If Art cannot imitate Life and remain Art (true art), the Oscar Wilde has it rightly; Art is the process of the destruction of sameness found in the material world when it first appears. III. The third doctrine is that Life imitates Art far more than Art imitates Life. This results not merely from Life's imitative instinct, but from the fact that the self-conscious aim of Life is to find expression, and that Art offers it certain beautiful forms through which it may realize that energy. It is a theory that has never been put forward before, but it is extremely fruitful, and throws an entirely new light upon the history of Art. It follows, as a corollary from this, that external Nature also imitates Art. The only effects that she can show us are effects that we have already seen through poetry, or in paintings. This is the secret of Nature's charm, as well as the explanation of Nature's weakness. What humans do in life imitates whatever we find around us, so whenever we find Art, we can replicate it by creating new incarnations or example of it. This devolves eventually into the form of art we know as kitsch followed by its becoming unpopular over time. Our sensory apparatus is such that once we are sensitized to a certain perception, we find more and more examples of that perception around us, and this leads more credence to Wilde's at first preposterous claim that Life imititates Art, rightly understood. IV. The final revelation is that Lying, the telling of beautiful untrue things, is the proper aim of Art. Another claim by Wilde, which prima facie seems preposterous, but, upon deeper reflection and thought, is seen as a deep insight into the process of Art. With the statement that "Lying is the proper aim of Art" Wilde points to Art paradoxically as "the process of destruction", the destruction of the sameness we find laid all around us in the physical world, up until now. [page 37] Nor can credit be gained from pointing them out: yet, to put readers at their ease, I will here define them: they may be called Oddity and Obscurity; and since the first may provoke laughter when a writer is serious (and this poet is always serious), while the latter must prevent him from being understood (and this poet has always something to say), it may be assumed that they were not a part of his intention. [page 38] No doubt my poetry errs on the side of oddness. I hope in time to have a more balanced and Miltonic style. But as air, melody, is what strikes me most of all in music and design in painting, so design, pattern, or what I am in the habit of calling inscape is what I above all aim at in poetry. Now it is the virtue of design, pattern, or inscape to be distinctive and it is the vice of distinctiveness to become queer. This vice I have not escaped." Hopkins above speaks the theme of my essay, Art is the Process of Destruction. Art, as I aver therein, is the process of the destruction of sameness. This comes about because everyone's inscape is unique. Whether one designs paintings or poetry from one's inscape, the evocation of one's inscape will seem odd because of the destruction of the sameness expected by afficionados of all other extant instances of painting and poetry. Such oddness — based on the destruction of sameness — is the hallmark of the true artist; such oddness is worthy of the name creation and all other artworks may be deemed worthy only to be called replication or craftworks. With me a picture is a sum of destructions. I make a picture, and proceed to destroy it. But in the end nothing is lost; the red I have removed from one part shows up in another. [page 14] What is characteristic of the great work of art is that its metaphoric artifice, its juxtapositions, have not only surprise value but also illuminating novelty. The two combine to create what we shall later refer to as "effective surprise." This is Bruner's way of saying that "art is the process of destruction of sameness" as I have written elsewhere. "The road to banality is paved with creative intentions," Bruner says (page 18), and just as the instructions on the cake mix box, the banality shows up in replication and kitsch. In his book, Unancestral Voice, Owen Barfield noted the words of Ralph Waldo Emerson, who wrote, "When men cease to look only for continuity they will find that there is this destruction of the form, this momentary return to chaos in every common seed in the article of its germination." 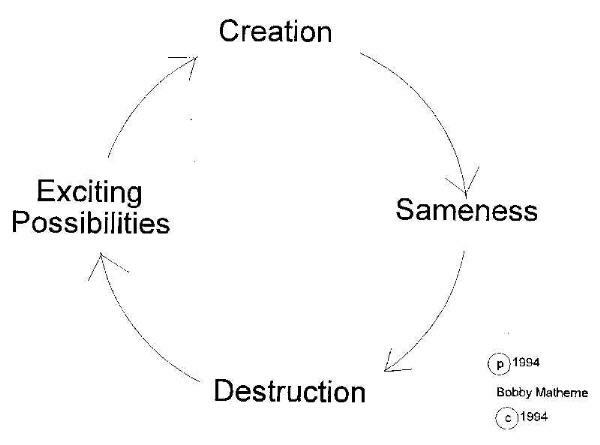 This illustrates the cycle of creation and destruction occurs in every seed's germination. And I commented in the review, "The process of art is the process of destruction — destruction of the deadly dance of kitsch in which form and meaning are intertwined — when Picasso interrupted the dance, cubism happened." [page 21] An idea is a point of departure and no more. As soon as you elaborate it, it becomes transformed by thought. . . . Every act of creation is first an act of destruction. . . I am always doing that which I cannot do, in order that I may learn how to do it. . . . I do not seek. I find. When Picasso says "every act of creation is first an act of destruction" he is punctuating creation and destruction and separating the two as I have in this essay. What he doesn't specify is what is it that is being destroyed during the destruction which leads up to creation, but he certainly demonstrated it in his works which broke the pattern of sameness in art, the dance of kitsch, and opened the spigot on previously dammed up artistic juices. ...effective censorship is a contradiction in terms. Like pruning, it gives new vigor to what it cuts back; but if it attacks the root, it destroys the plant it is supposed to save. If modern art is sometimes shrill, it is not the fault of the artist alone. We all tend to raise our voices when we speak to persons who are getting deaf. As Croce rather brusquely put it, there is no 'double bottom' to the suitcase of art. [page 137] Hence, if we really wish to grasp what art is, we must never forget that its fundamental concern must always and forever be to depict the battle between beauty and ugliness. Reality is achieved only by seeking a state of balance between them, and not when we accept the one-sided reality intended for us by Lucifer and Ahriman. Another example of how Nietzsche's way of thinking found its way into Jung's life is given in this quote of Jolande Jacobi. In this quote, read chaos as referring to a "destruction of sameness" which releases exciting possibilities, i. e., 'gives birth to a dancing star'. [page 340] Summing up Jung's attitude to what was going on in Germany, Jolande Jacobi said: 'His idea was that chaos gives birth to good or to something valuable. So in the German movement he saw a chaotic (we could say) precondition for the birth of a new world.' He may have been remembering Nietzsche's dictum that chaos gives birth to a dancing star. I have used words, diagrams, and quotes to describe art as the process of destruction, up until now. Here is an artwork, a painting, that describes art as the process of destruction. The painting (acrylic on masonite) was painted by Maureen Grace Matherne Bayhi, my daughter, several years ago, likely before I wrote this original essay on art. She is a fine arts graduate of University of New Orleans and is chairman of the Art Department of Bonnabel High School in Metairie, adjacent to New Orleans, as I am writing this in 2004. Her painting is entitled "Angel and Broken Vase" or simply "Angel & Vase". The Angel appears from the left and is apparently blessing the vase which has fallen over and broken open into several pieces, two of which are shown. Out of the broken vase, a living vine is growing. This helped me to see that the vine represents the Living Christ and that we are each one of His branches and each of us shall produce great things through Him in a new world sans churches, where spirituality doesn’t need a cover — whether it be a dogma, a church building, or a priest — to be present in a human’s soul from now on. The vase is shattered and the vine grows on. Another interpretation came to me a few days later which belongs in this essay. The “Angel & Vase” painting represents the essence of “Art as the Process of Destruction”. The vase is the 'sameness' that true art destroys, and the vine is the living process vented in from the spiritual world by the art. The vase is a dead object, molded and fired from clay. It stays ever the same — it retains its form which dates back to the ancient Greek amphoras which were used to store wine. Every vase replicates the form of the original amphoras it was designed from. The form is the same. In the painting, “Angel & Vase”, the sameness of the form is destroyed! And growing out of the destruction of the vase is a living vine whose form is ever changing from day to day, minute to minute — just as true art is ever changing with each inspiration from the spiritual world which enters an artist's soul and finds its way into an artistic production. Inspiration springs fresh from the spiritual world represented by the Angel and flows into the artist's soul through the tips of the Angel's outstretched fingers. The artist uses the inspiration and creates an artwork for all to enjoy in wonder and awe. For awe is the expression of appreciation of a true piece of art newly sprung into being. Our soul is held in thrall of the spirit newly released before our eyes. Thus the "Angel & Vase" painting itself is a representation of Art as the Process of Destruction, among other things! 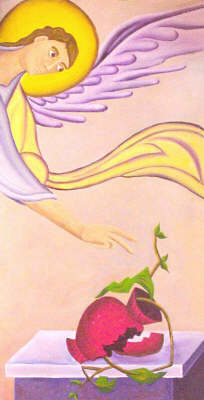 Today, October 27, 2004, as I meditated on the "Angel & Vase" painting, it occurred to me that only an angel’s blessing can cause a living vine to spring from dead clay. The angels, archangels and the rest of the hierarchy all had a hand in shaping the spiritual essences from which the human being eventually arose into a material body. The painting represents an error — something is shown which is in error with what we know about the universe from our materialistic science. No living vine can grow from an empty clay pot. We know it is empty because it is toppled and broken open and no sign of any living soil is present. Rudolf Steiner takes us systematically through an argument that leaves us certain that in error there is proof that a supersensible world exists. In the realm of the spiritual world, Steiner posits, in effect, “I err, therefore I am.” The epistemological impact of this insight of Steiner’s almost a hundred years ago has obviously been missed by many scientists, statesmen, and divines who every day give the world ample proof that error exists. They paradoxically believe that the spiritual world doesn't exist whilst ample proof for its existence surround them, even exude from their teachings. [page 178] Nothing is reflected from the external world that could serve as a basis for accepting the existence of an error. There would have to be a factor not belonging to or in any way directly related to the external world. If the sense perceptible reflects itself as a supersensible picture in truth, then if the sense perceptible is reflected as an error, there must be a reason other than that lying in the sense perceptible itself for the resulting error. What are we looking at, then, when we perceive that the error is there? We are looking at a world that consists of more than a material world of the senses, more than the world of external physical facts. Error can originate in a supersensible world only. To work one’s way into the supersensible world is to consciously focus on an error, that is, on some object which does not exist in the physical world. For example, one image that will be immediately be recognizable to students of the spiritual world is that of the rosy cross, which is composed of roses growing on black, dead wood in the shape of a cross. Since live roses cannot grow from dead wood, this is an image that must be in error because it cannot exist in the physical world. For this reason, the image of the rosy cross has provided for many centuries a symbol upon which to meditate as a communications gateway into the spiritual world. Thus, we can come to see the "Angel & Vase" painting as a 21st Century version of the rosy cross and use it as an object of meditation to gain insight into the spiritual or supersensible world. Art does not reproduce the visible. It renders it visible. He who would create the new must be able to endure the passing of the old in full tranquillity. From: The Soul's Awakening by Rudolf Steiner. Art should simplify . . . finding what convention of form and what detail one can do without and yet preserve the spirit of the whole — so that all that one has suppressed and cut away is there to the reader's consciousness as much as if it were in type on the page. I read your essay and was moved to tears; an original thought does that to me. To those concerned about the growing dissolution and irrelevance of the intelligentsia, which is indeed alarming, I suggest that there have always been two kinds of original thinkers — those who upon viewing disorder try to create order, and those who upon encountering order try to protest it by creating disorder. The tension between the two is what drives learning forward. It lifts us upward on a zigzagging trajectory of progress. And in the Darwinian contest of ideas order always wins, because — simply — that is the way the real world works. 2If you will look at the book cover of Kundera's The Book of Laughter and Forgetting, you'll notice that the ring of floating angels cast the shadow of a devil's face on the ground. Return to text before footnote 2. 3 Note how my initial insight was an example in process of what I came later to express in content in the phrase "art is the process of destruction". This is an example of the bootstrap paradox at work. I have written on this paradox in several dozen reviews and essays which you can find by doing a Google on "bootstrap" for this website. Check this one for a complete discussion of the bootstrap paradox. Let me make myself clear about how my initial insight is an example of the bootstrap paradox or process. The phrase "convential wisdom" expresses a sameness, a stagnant map of the territory of life. That insight blew the stale air right out the window and, with that defenestration, left behind the exhilarating freshness of a Spring morning. It's like what happens inside of a moribund computer when the reboot buttons are hit — everything inside the computer springs to life and your screen becomes active again. What happened inside of me was exactly the process of the destruction of sameness that the phrase "art is the process of destruction" refers to in content. Open the doors and windows of the soul, an insight has arrived and newness has entered the world! Return to text before footnote 3. Auto-destructive art, is art which is created with elements which necessarily lead to their destruction. The art is the process of destruction itself. The greatest exponent of ADA is Gustav Metzger. According to Gustav Metzger, ADA must not endure beyond a maximum period of twenty years, much shorter than the avarage human life span. Time in Metzger's analysis is not a measure of endurance but on the contrary is an instrument of corrosion. Return to text before footnote 4.